Trampled By Turtles On January 26 Moved To The Orpheum | True Endeavors Presents: music, tours, tickets, mp3 downloads, concert pictures, videos, Madison WI. 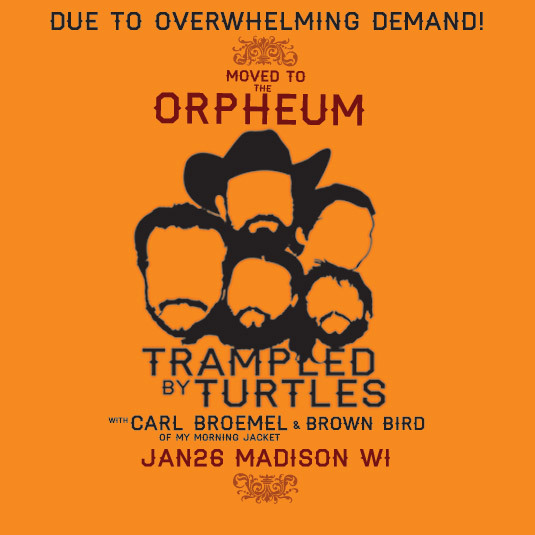 In cooperation with the Overture Center, the Trampled By Turtles show scheduled for January 26 is being moved from the Capitol Theater to the Orpheum Theater due to overwhelming demand. All Capitol Theater tickets previously purchased for the show will be honored at the door.